Nokia yesterday launched the most awaited N-Series smartphone N97 in Indian market. Nokia N97 is powered by the latest Symbian S60V5 touch operating system that was introduced in Nokia 5800 Xpress music. The device has a pretty large but resistive touch screen of 3.5″ size, 360 x 640 pixels resolution and 16 million color support. Another great feature of N97 is the 32GB inbuilt memory that is further expandable up to 48 GB, and five mega pixel camera with Carl Zeiss Tessar lens. Comparing the specs Nokia N97 appears to be the flagship product of Nokia and would compete with iPhone 3G S and other recent phone releases. Nokia N97 as shown in the photo, is a QWERTY slider smartphone with Touch screen. 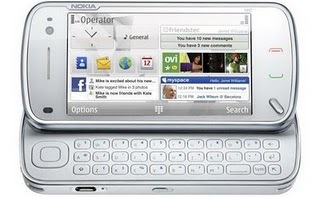 Nokia N97 uses a resistive touch screen so it won’t be as responsive as capacitive touch devices like iPhone. The OS is good but it looks buggy at the moment. Nokia would release a software update to fix this issue. Nevertheless the features of the OS is pretty impressive. It has a widgetised home screen with email, social updates, messages all in one place. Applications can be installed from the integrated Nokia Ovi Store. GPRS, 3G, WLAN, Bluetooth, Wi-Fi and Micro USB 2.0 are available. Like in N95 and recent Nokia Nseries phones, N97 also has a 5 mega pixels camera with autofocus and LED flash which supports video recording upto 30 FPS. Nokia N97 has an ARM 11 434 MHz processor. It is the first phone shipped with inbuilt applications for accessing recently launched Nokia Ovi store. Normal messaging features Messaging SMS, MMS, Email, Push Email and IM are supported. Full functional web browser with WAP 2.0/xHTML, HTML, RSS feeds. Unlike the default Nokia Visual radio in earlier Nseries phones, Nokia N97 has a FM transmitter that can send radio signals to near by FM receivers. Assisted GPS support and Nokia Maps touch version, Java MIDP 2.1, Digital compass, TV out, Voice command. Plays video formats like MPEG4/WMV/3gp/Flash video player. QuickOffice Pocket Office solution the supports Microsoft office documents like Word, PowerPoint and Excel. Flash Lite 3 for playing Youtube videos and other streaming FLV media. Latest price of Nokia N97 in India: 19500/- INR. Update: New phones with capacitive touch screen are now available in India. You can check our Nokia section or compare other devices to select a suitable one.